Welcome to another segment of my continuing series “Then & Now,” which features places which helped mold me into the person I am today – whatever that means. Today, we will go to the Buffalo Lake I remember as a child and as a young adult. 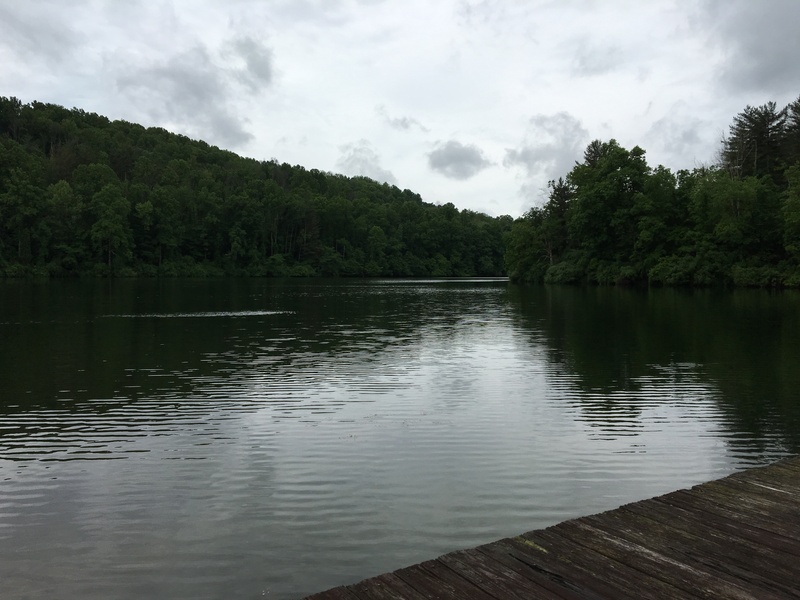 I am sure many of you have similar places, whether it be a favorite swimming pool, an old rope tied to a tree limb over your favorite swimming hole, or a mountain stream. Mine just happens to be a very special lake – Buffalo Lake. We simply called it ‘Buffalo.’ It is located a few miles south of my hometown of Clarksburg West Virginia. As a child, dad often took me there fishing. It was from the banks of Buffalo where I caught my first real bragging-rights fish, a 14” large-mouth bass – I was 12. I fondly remember family picnics around the lake. There was a shelter and several picnic tables. Dad and I would fish while mom fixed lunch. They even had boats you could rent and what we called ‘paddle paddles.’ The parking lot in front of the bathhouse was always packed on weekends. Put all your clothes into a small wire basket, pin the number to your swim trunks, hand over the basket to the office, and off to the grass beach we went. Do your best to visualize what a wonderful place this was...for old and young alike. And now, it is time to join me on a journey to this special place. As you read about and view the pictures, stop for a few minutes and think about your special youthful place. This is Buffalo Lake way before my time. Notice the difference in the trees in this photo and some of the following. An aerial view of Buffalo in her youth. Lakes were young once also. The year was 1967. The year I graduated from high school. This was the grass beach in front of the bathhouse. There was a concrete walk with steps, a slide, and diving board where only the brave dare venture. Steps were strategically placed around the concrete walkway. A popular place for young lovers. Notice the walk and grass area in the background. This is another picture of Lynn and her soon-to-be husband, Robin. They were married 46 years. Robin was a lifeguard at the lake. If you wanted to get away from the crowds on the grass beach, you could always rent a boat and take a quiet row around the lake. 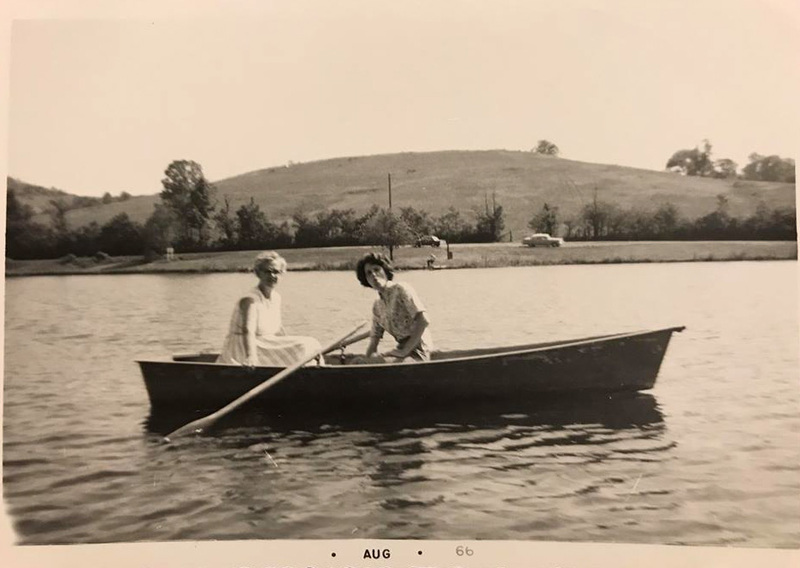 Tisha Elko Lang provided this picture of her mother and grandmother in 1966. Looking closely, over Tisha's mother's right shoulder, the man sitting on the bank fishing is in the exact spot where I caught my largemouth bass when I was 12. Buffalo Lake...A favorite place for families, teenagers, and children of all ages. I left Clarksburg in 1972 and did not return to Buffalo Lake until the Spring of 2005. In my three-decade absence, there were many changes according to my father. Even though his swimming days were over, he continued to fish the banks close the dam, hoping to catch a large channel catfish. As I was told and learned during my years in absence, the lake was an emergency water supply for my city. Over the years the city decided it did not need this source anymore. 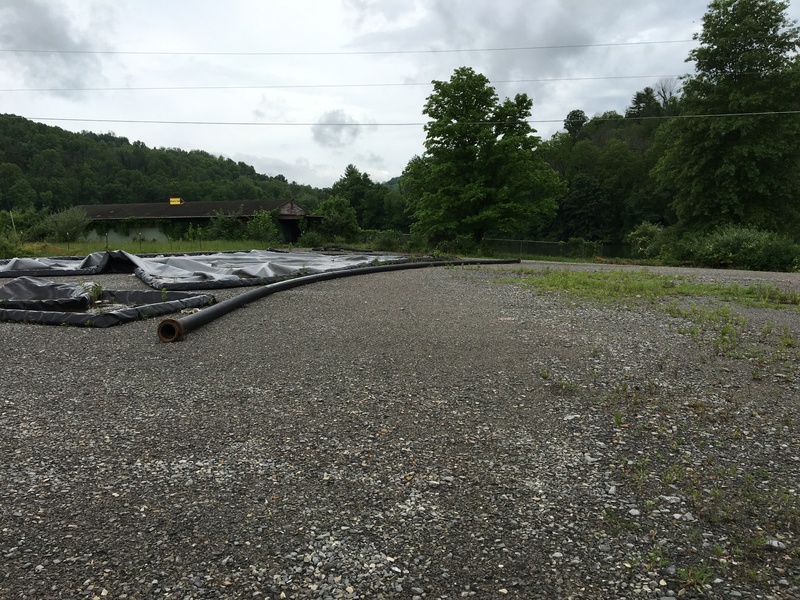 Also, there were questions regarding the integrity of the dam and ensuing liability issues if it were to collapse. 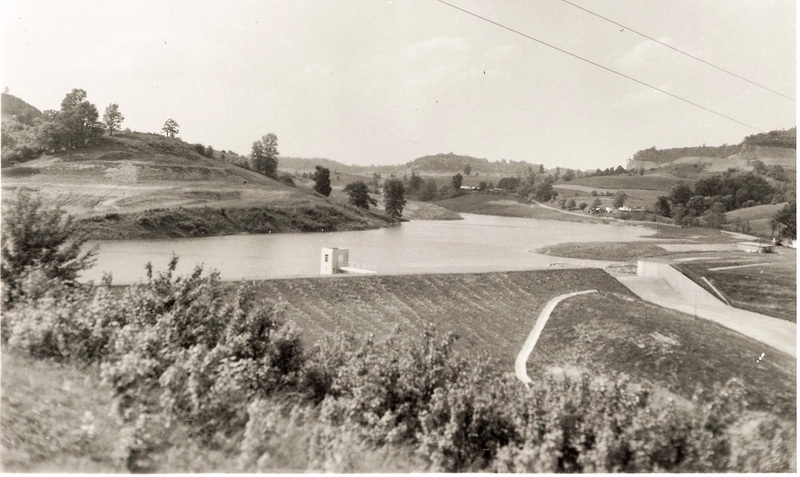 Houses still exist below the dam today. Complicating the matter even more, like many of the public and private lakes around the northern part of the state, they became homes for thousands of Canadian geese who decided to call West Virginia their home. 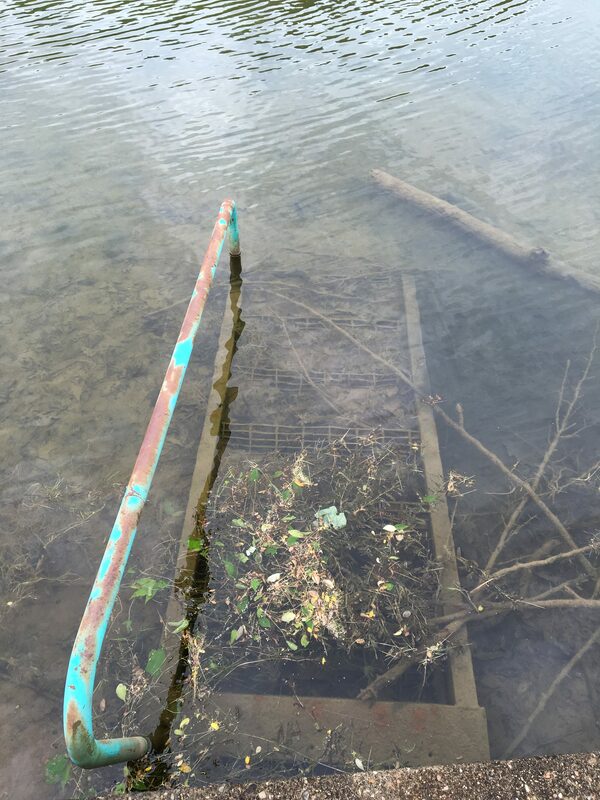 Unfortunately, due to the large goose population at Buffalo, the water became fouled (fowled) with so much goose feces that in 1998 the lake was closed for swimming. Shortly thereafter, the lake was sold. 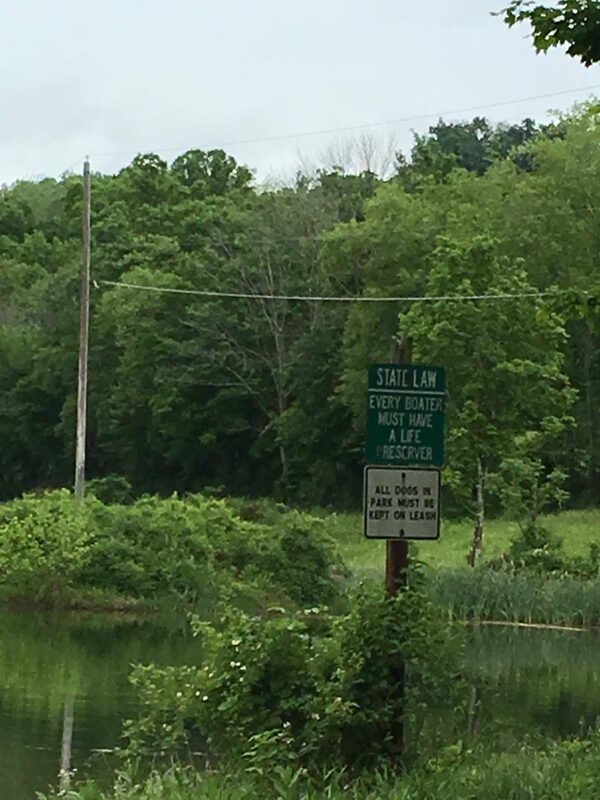 I am not sure who originally purchased the lake, but it is currently owned by a prominent Clarksburg businessman/restaurateur and an equally prominent attorney. 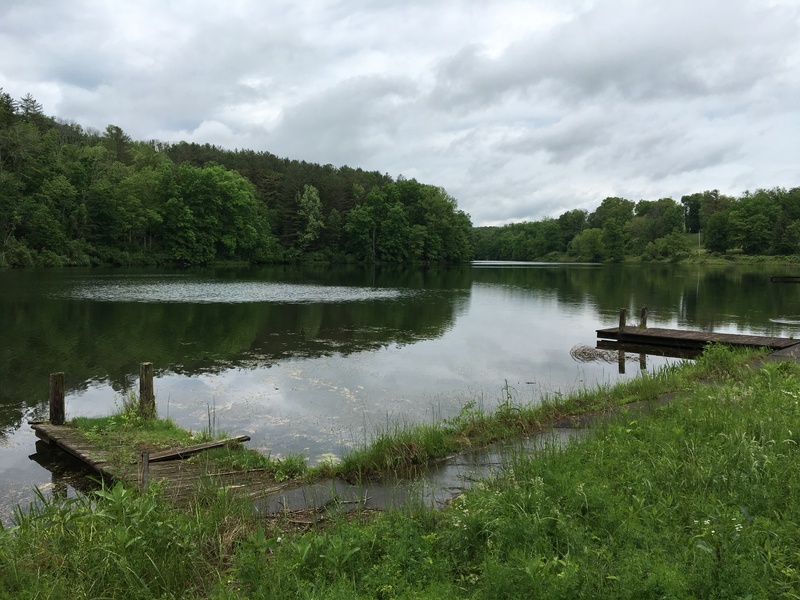 In addition to the lake, they have reportedly purchased hundreds of acres surrounding the lake. Their company is called Buffalo Lake Development LLC. At that time, the lake was closed for boating, swimming, and fishing. Reportedly, some timber has been removed and there are rumors of mining activities, but I can not substantiate either. 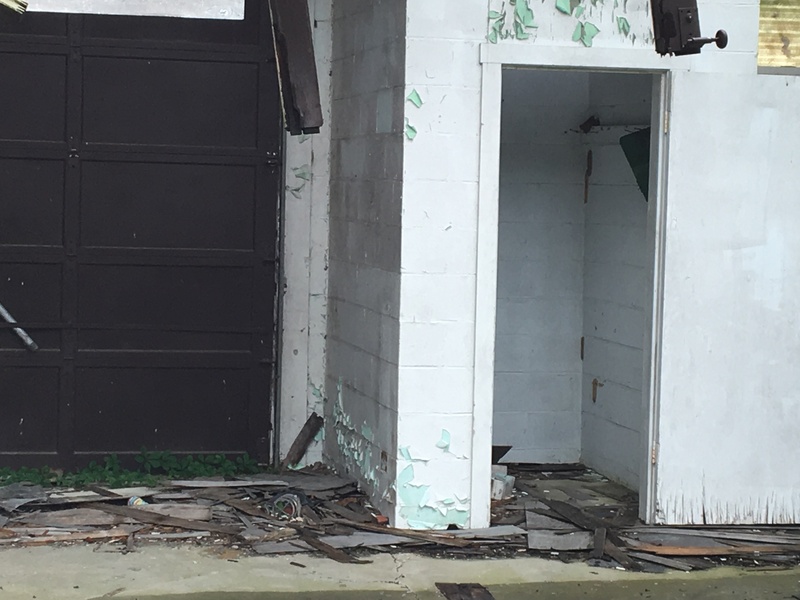 Instead of a well-maintained parking lot and bathhouse, all I saw was 'overgrown', dilapidated, and a lot littered with plastic and pipe. The bathhouse was crumbling. The weeds on the grass beach were thigh-high. The steps from the bathhouse to the concrete walk were almost impassable. Although that day I only saw two geese on the lake, their presence was unmistakable. I did not even attempt the steps. The concrete walkway was cracked and weeds replaced the feet of visitors from the past. 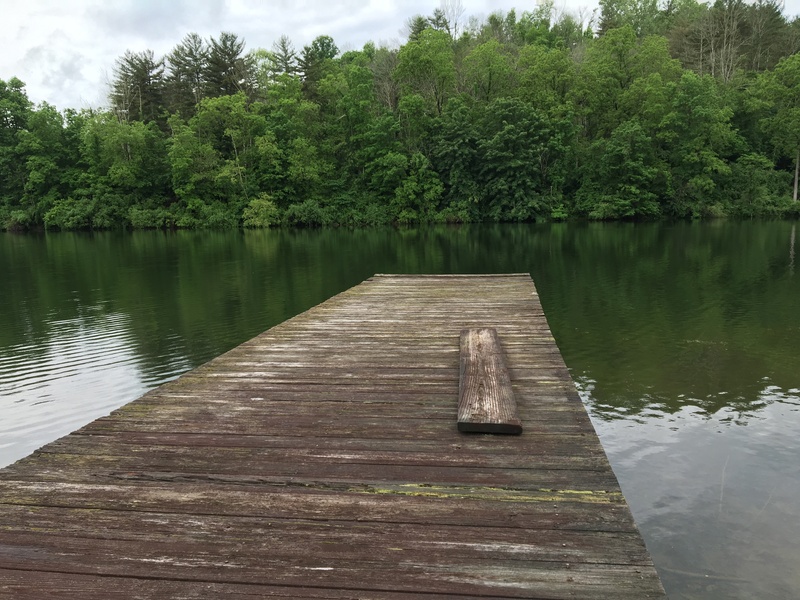 The wooden dock that once held the platform for our diving board was warped, moss-covered, and splitting. 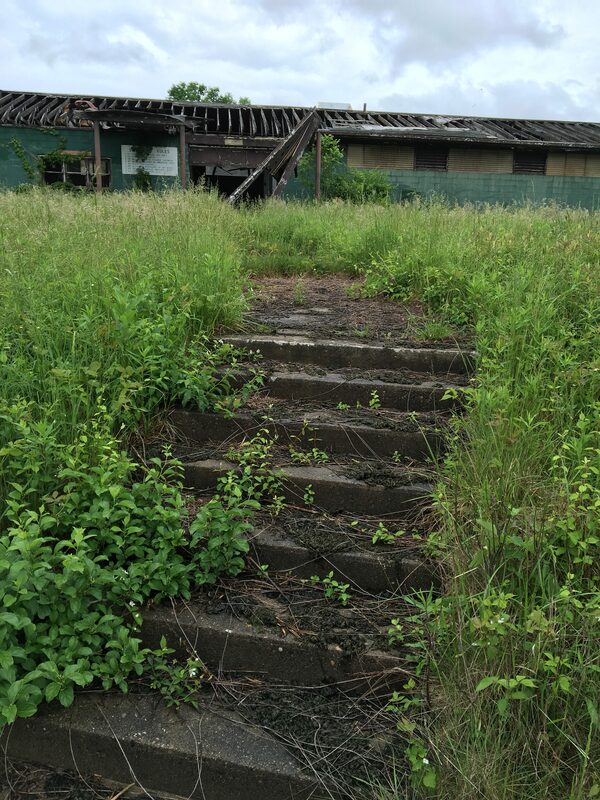 This could have easily been the steps and ladder where Robin and Lynn had their picture taken in 1969. 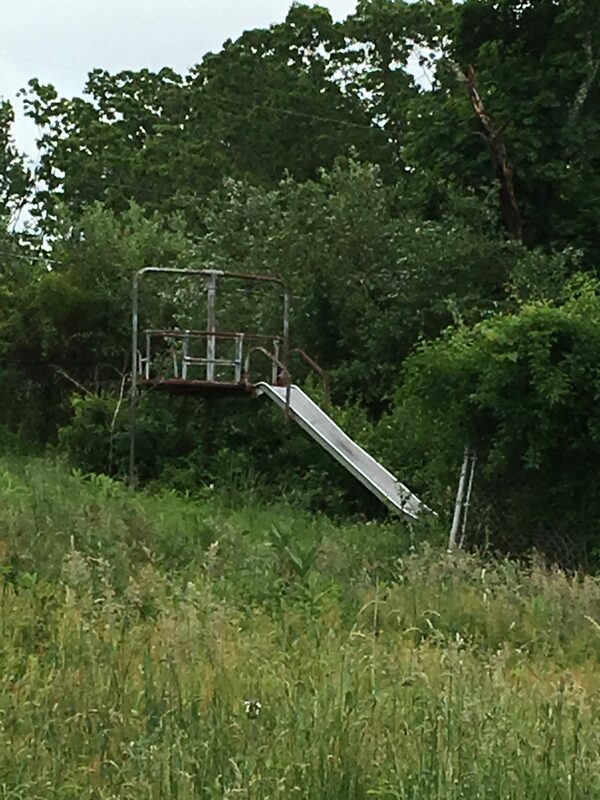 The slide that once held laughing children and launched us high in the air sat silent and rusting, far away from lakes-edge. 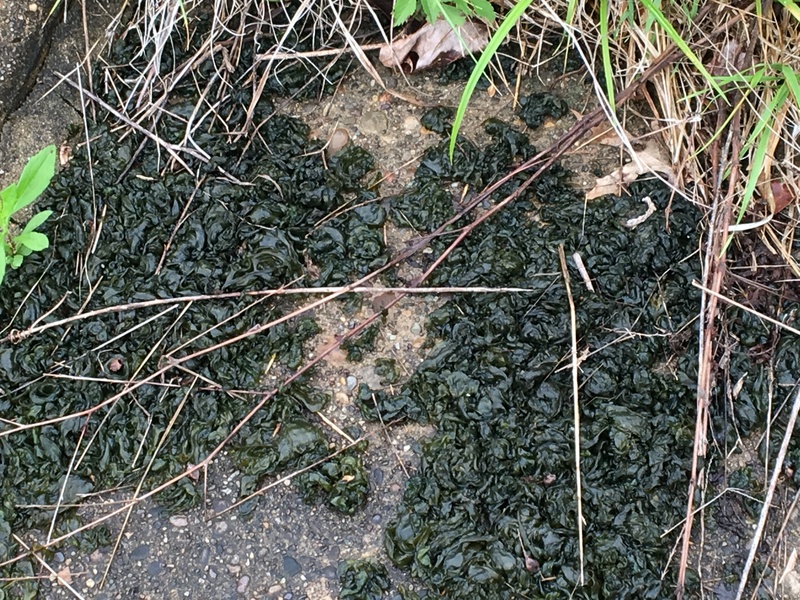 Even though there were high weeds and rust everywhere, there were signs of what was...once. As I was about to leave, I caught a glimpse of this sign. And then, I turned around and saw what was still there...a beautiful lake that is begging to once again hear the laughter of children, to provide a wholesome place for families to gather, a place for a father to take his son or daughter fishing, and a gathering place where young love can blossom - like Lynn and Robin's. When I returned to my truck, I stopped and turned around to take a final look at the Buffalo Lake before me...what it was "Now." It made me so sad. Not sad for myself, because I have wonderful memories. But sad for the generation that came after me...the young families today, the children, and the teenagers who will never know the simple pleasures of a Saturday afternoon with friends on that manicured grass beach. 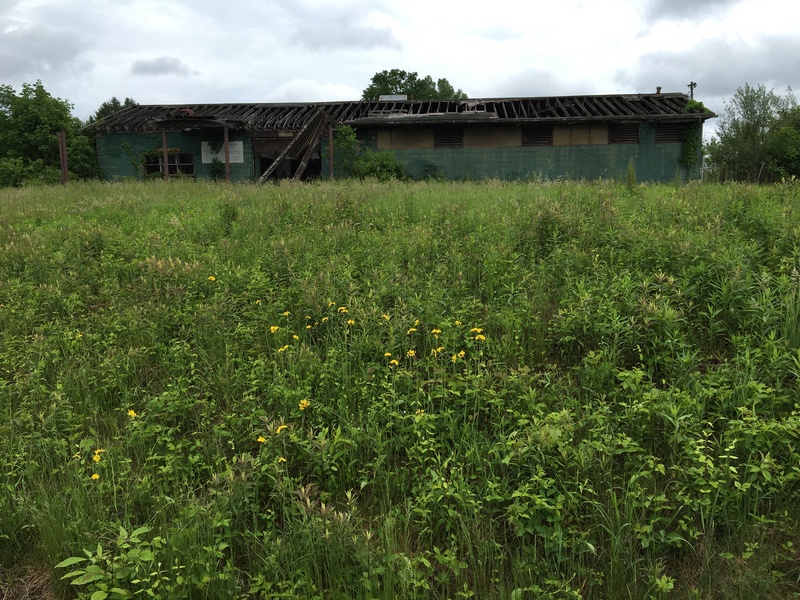 I have no idea what the two principal partners of Buffalo Lake Development LLC have in store for this once beautiful piece of property. However, I hope the name "Buffalo Lake Development LLC" just might be a clue - focusing on 'development.' I am sure they have plans for the property. But, what are the plans? From 2005 to present, each year it looks worse than the previous year. This was once such an important recreational area. And, it could be one again...if it was re-purposed as such. However, as businessmen, it usually comes down to profit and I guess there would not be enough profit in reviving the lake as a recreational area. On the other hand, beautiful lake-front homes strategically placed along the shore could generate a considerable profit. 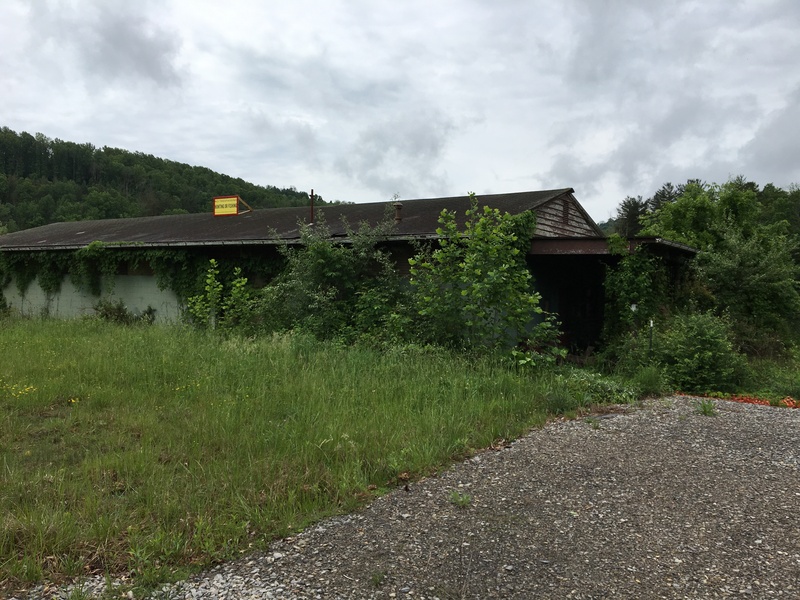 Or, could we possibly see and support a five-star lake-front restaurant on the sight of the crumbling bathhouse? The Buffalo Lake I remember "Then" is not the Buffalo Lake I see "Now." But, it does not have to remain that way. With vision, the right amount of resources, and a desire to create something of beauty, whether it be a revived recreational area, beautiful homes, a five-star restaurant, or even a well-maintained nature area...it can and should be done. Done, not for my generation, because we have the memories. It should be done for the young people of this generation. Buffalo Lake Development LLC...what is your vision? Thank you for taking the time to indulge an old man as he walks with memories and dreams about not what is, but what could be. I will continue to develop this series "Then & Now" and look forward to your feedback and suggestions. Special thanks to Bill Sauerwein, Judy Stalensky-Reider, Lynn Newhouse (and Robin), Richard Duez, Tisha Elko Lang, and those who maintain the Beautify Buffalo Lake FaceBook page for all your help. Many people looked long and hard to provide pictures and information. I hope it evolves into something positive. One thing I know for sure, Buffalo Lake does not deserve to keep crumbling. I really miss this being an excellent place yo bring families to swim fish and even camp. I don’t think the State of W. V. Should stop closing State Parks and Developers should keep places like Buffalo Lake open for Recreational use. When I was growing up you never heard of all the trouble kids got into because families did stuff together going yo these places. Get these kids back to nature much better outcome of our younger people. What a beautiful article. I too have fond memories of Buffalo Lake as a child. We had a family reunion in the mid 80’s there it was beautiful. My parents would take us fishing and swimming there on the weekends. I can remember doing the moonwalk on the slippery concrete slab. It was always neat to swim out to the dock and go under it and see the sunlight come through and reflect off the water. They even held hooked on fishing not on drugs tournaments at the lake in the 90’s. It would be wonderful to see it come back to life. Thank you, Michael, for taking the time to write this. I feel the same way you do and hope that something good becomes of Buffalo. In the 1950’s I rode with my father as he drove his truck pulling the hay loader to take the last crop of hay from the meadow at the bottom of Buffalo Lake.Two of my older brothers were in Agriculture class at Unidis High School and the FFA, then called the Future Farmers of America, planted pine trees on the hillside above the new lake in the late 1950s. As a Mining and Reclamation Inspector with the West Virginia Department of Environmental Protection I inspected a highwall mining operation on the hill beyond the far side of the lake around 2008-2011 that worked at the base of the old highwalls left from mining in the mid 20th century. Some of the white pines planted by my brothers were harvested during my tenure as inspector there and some new gas wells were drilled back there on the hills of Buffalo and Little Buffalo, a tributary that also feeds into the lake. Buffalo Creek was named after the eastern bison the pioneers found there and hunted to extinction. Buffalo Road, created in the late 18th century was named after the creek it parallels. Early in the 21st century some how the name got changed to Buffalo Lake Road. The Bison were there long before the lake but it seems we now choose to honor a decrepit man made lake rather than recognizing the bison that once roamed the banks of Buffalo Creek. I wonder, when the lake is gone, if the name will revert to Buffalo Road, or, perhaps we to shall pass into extinction and as the years march on the valley revert to wildlife adapted to the future condition. I to had a lot of memories there. I was very young maybe 5 or 6 years old. But I still remember going there and catching my first catfish. I have recently got a pass to fish the lake and have been kayaking it. I would love to see it cleaned up it’s to beautiful to go to waste. I remember the lake just as you but it was late 60 early 70s. I loved that place and would love to be able to fish that lake again. Yes I have lots of memories and some where at my mother’s house pictures. I can remember a bad storm at the lake. My mom took a boat across the lake to get my uncle during the storm. The wind was so bad that it was pushing the boat toward the dam. With a lot of hard rowing they made it back. It’s hard looking at the pictures of the lake now. So many family memories and that’s what this genaration lacks so sad. Would be nice to see it cleaned up again. I heard that Mike and Ike own it and are involved with coal and oil and gas so who knows what is in store for this beautiful lake. I remember the lake also! Great place I liked going out around it to sycamore also! Many things have changed in this area and not for the better! Loss of all our previous industries has left us with little more then a service economy and transient plane repair! although it seems they have a pretty good business here! The Shinston swimming pool of the past is now a really nice pool, moved from the old water treatment Plant site just passed the bridge! The chestnut hills pool is long gone and so is Stealey pool! Lake Floyd while still beautiful is home to many elderly folks who have few children living there! we visited this summer with my niece and her children there was a young boy of around 14 who was more than happy to have a couple of much younger boys to play with! 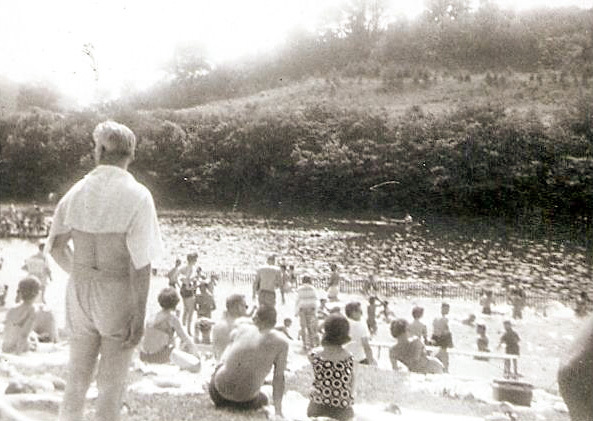 The lake is sorely lacking in youth and the activities of the past! No longer is the club house open till late in the evening, no more teen dances or juke box in the ballroom! The shuffle board courts are empty but still there And one lone ping pong table sets off to the side! The cost of living has out paced most of our young families ability to own land or lake property and has led to the rich or well to do to have control over what the youth of yesterday loved and enjoyed! I too moved back years ago in the 90’s and the leaders of the lake at the time were kids I grew up with ! With there adulthood went the hopes and dreams of the children! They no longer wanted the kids having the run of the lake, the noise of kids having fun was to much trouble for them! They didn’t want them getting in trouble like we did as kids! 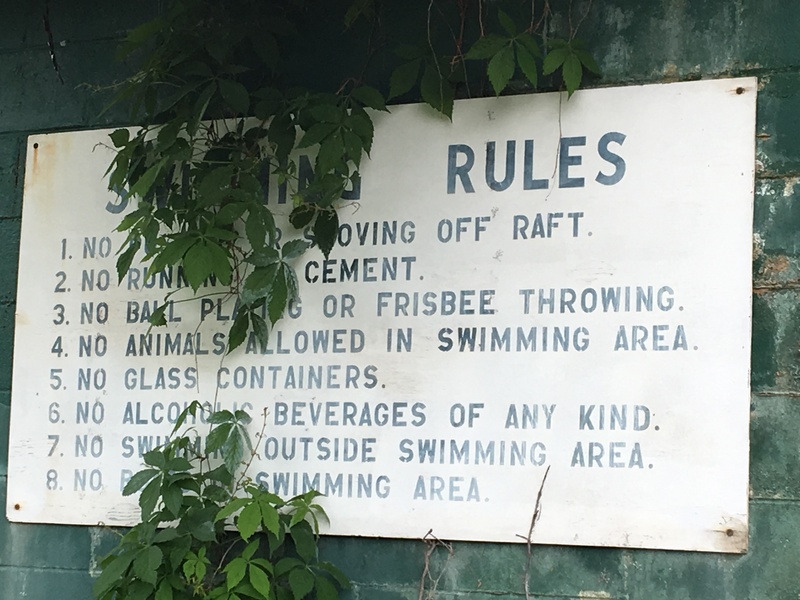 Of course the only trouble we got into was firecrackers, swimming after dark and rowing boats to the clubhouse after hours! We never destroyed any property and only had good wholesome fun! A few drinks of beer and wine on the weekends And no drownings or auto accidents as we stayed on the lake grounds and usually walked or biked,, that’s cycles not motor bikes by the way! What happened to the youth of yesterday, they got old and crochity and lost the need for fun and the antics of youth in the countryside! Hope someday things will change for the better here, doubt it will happen as the ones with the money to make it happen are to caught up in their own success! Sad isn’t it! Wonderful article! Brings back many memories. Like you, I have NO idea of the plan for the Lake but to let it sit and rot is a shame! I hope the owners read this and see how much it has meant to so many people and come up with a plan! Every year there is a High school business plan competition. This could be their focus! Students could develop a plan and present to the members of the Buffalo Lake Debelopment LLC group. Thank you for the article! I will share with my students. Thanks for the memories, good ones that area provided. 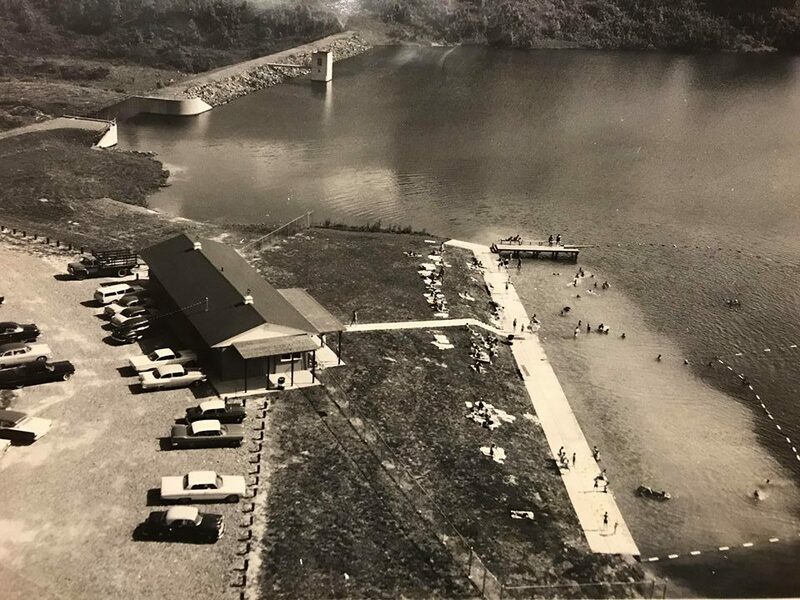 Buffalo Lake,Hideaway,Watters Smith State Park,three public Swimming Venues that are sadly no more.It would be nice to atleast get a Free Splash Pad in Southern Harrison County,atleast something for the kids,maybe it could be a County Project,South Harrison High School etc…something that could be free and accessible. I too have wonderful memories of Buffalo Lake. I like you hope for some kind of restoring development to indulge my fond memories. Its sad that the lake was closed, I also wish it could be reopened to the public, so many good memories there with family and friends! Thanks for sharing!! So sad. I would love to share this place with my Granddaughter. It use to be a big part of our lives! As far back as I can possibly remember my Daddy and I would spend hours at this lake. He loved to fish and I was able to run around just being a kid. It was beautiful. Unfortunately I have no pictures to share with my Grandchildren but now, living only a few miles from the lake I have been able to show them the lake and tell them of my memories with my Daddy, their Great Grandfather and what was once a beautiful family area. Wouldn’t it be wonderful if the area was redeveloped so families could share good times here again? Yes, I remember the paddle and row boats, swimming, all things of the past. The current owners could change all of this. Thanks MIKE. Hoping u keep it up. You have the same memories that I do regarding Buffalo Lake with the exception of fishing. My mother and father took me to Buffalo Lake as a child. I remember shivering on a towel, in the grass at the side of the lake after spending several hours in and out of the water. It was a beautiful place then. I had forgotten about Buffalo Lake until you shared this memory. So sad it is in this condition now. Thank you for sharing your memories with us Michael. I’m sure many of us baby boomers that grew up in Clarksburg area share the same memories. I have happy childhood memories of the lake and took my family there when I visited home again. I was just recently back in W. Va. Again visiting and had hoped to visit Buffalo Lake not knowing what had happened, but didn’t get there. My daughter just sent this information to me. Oh my gosh ! This brought back great memories. I graduated, from WI, in 1977. It seems like I spent all summer there while school was out. I remember Johnny Elko and Miss Sarah running the place. There was a young lady, named Lila, that we were friends with, who also lived in a house very close to the lake. My dad used to take me fishing where the spillway ended. Best memory of him I ever had ! I was in town a few years ago and drove out to see it. It was like losing an old friend. What shambles it is in now. I wanted to cry…what happened ? That was Lila, Brad, and Lisa Allen who lived directly across from the lake house. Yes, Sarah, Johnny, and Bernie Elco were all good people. 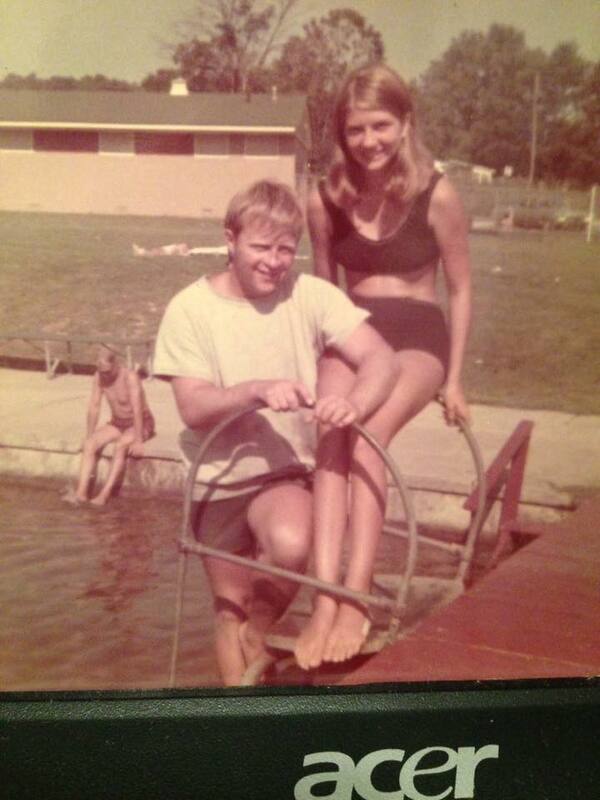 I life guarded during the Summers of 74 and 75, , with Bill Brown, Skip Kintz, Mark Coffindaffer, and many others. That was a very unique time in my life. I visited about a year ago, and was left with the same sadness that was reflected in the story. I spent every summer day I could here as a teen. 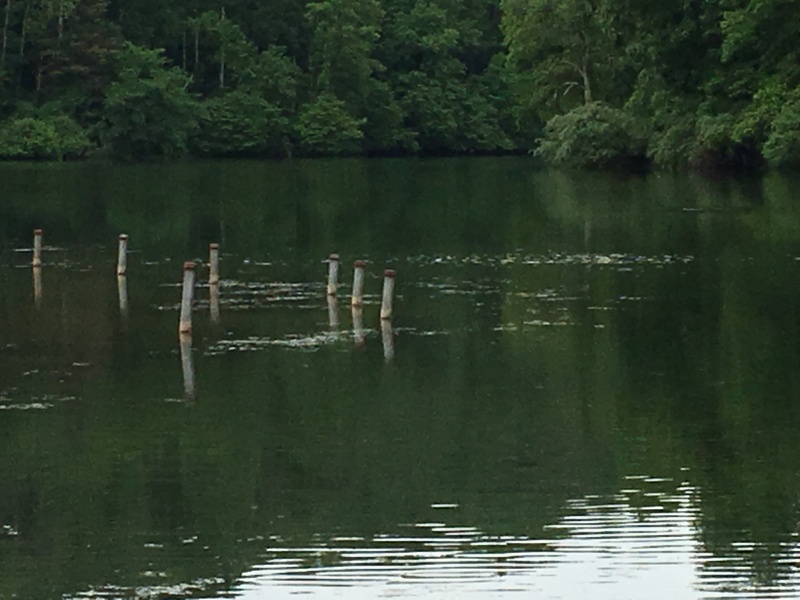 As a little girl my dad took me and my brother fishing here…. 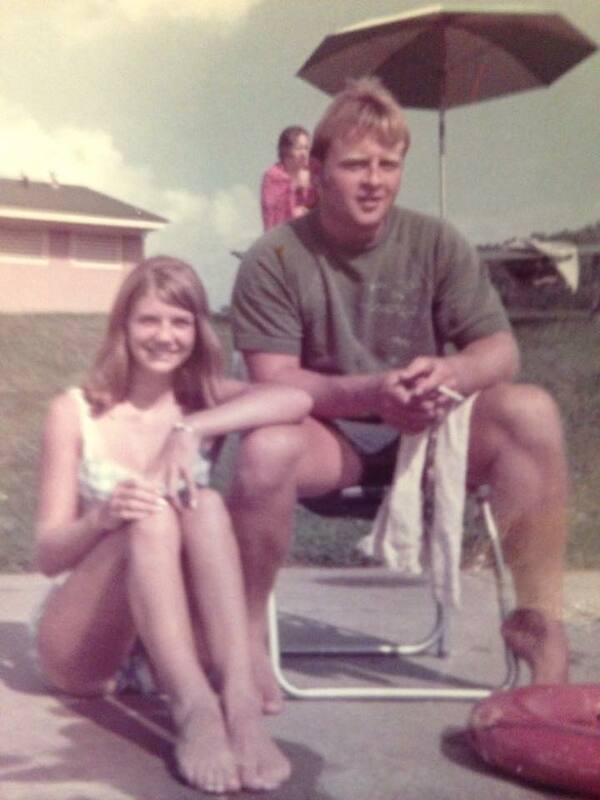 I graduated high school, left almost immediately afterward for basic training.. Met my husband in yhe army, married, had four children.. Long story short, husband retired from the mil, we mived back to my home town, I couldn’t wait to show them the wonderful pkace I ” summered” every year.. Two days after we landed back home I had them pack their suits, towels, goggles, paddleboards, etc and off we went… We arrived there to the same devastation you saw. The kids apologized, knowing I was so looking fwd to this day. I cried a little, and we drove to Bergoo to swim in the river. This amazing place holds such dear memories for my family! It is a complete disgrace to see what it has become — so sad! Our entire family would meet there almost every weekend and it was the best times we had! It’s very disheartening to see the mess that is left there now! Why has the state (or anyone, for that matter) not maintained the upkeep or at least made it useful or available to the public again – I will never understand. 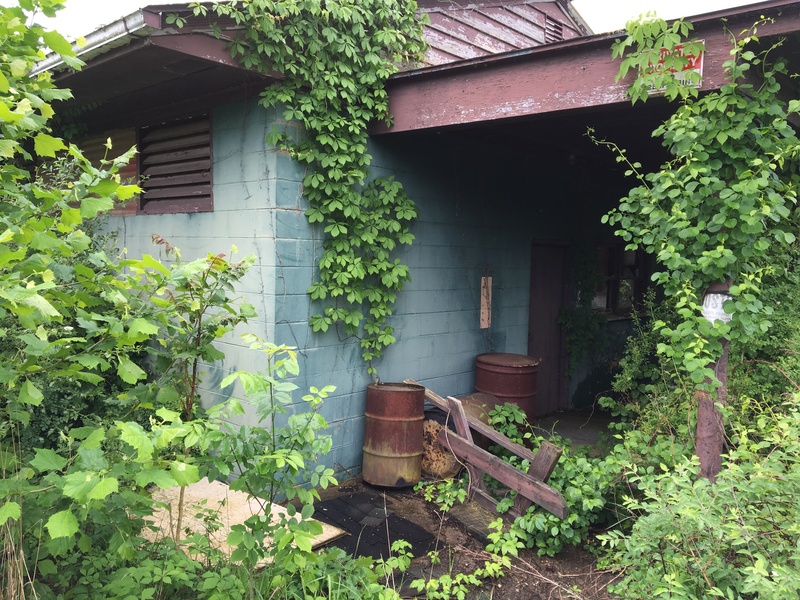 With so many people trying and wishing to see some sort of restoration done with it, you would think that the people or business in charge of it would at least try. I know of so many people who want it back open! Such a shame! Michael, thank you for sharing this. Great memories with my dad and cousins. He would take us to Buffalo Lake every chance he got. Sad that business people only think of the money and not the communities that help supply that money. I think it is a shame to let a place that once was such a beautiful place to run down the way it did. I had so many wonderful memories there ! It was so Amazing a place until someone got greedy. Now it is in ruins, and that breaks my heart. Maybe we could get volunteer to start fixing it up, and people and companies to donate money and materials. Everyone should care about this place. We spent every summer day at Hide-A-Way or Buffalo Lake. Before I was a teenager the diving board seemed so tall, a true high-dive. My uncle and I would spend all day diving to see who could outdo each other. Reading the story above, I could smell the lake I once played in.